The streets of Arashiyama are ablaze with old and new technologies. Cars and tourist buses zip about letting people on and off while rickshaws and horse-drawn carriages also plod along the road, a reflection of the modes of transportation seen here during the Edo period. Arashiyama's iconic river and laid back attitude have drawn visitors here for hundreds of years, and despite a few mod-cons, this little village still feels like stepping back in time. The Togetsukyo Bridge is Arashiyama's most popular landmark and one of the first things you see when you come into the city. The Togetsukyo Bridge (or "Moon Crossing Bridge") was first built in the 10th century, but its current incarnation is a reconstruction from the 1930s. Cherry blossom trees run up and down the river's edge, and during the spring time, the blooms draw thousands of people to this site. With the mountains in the background and the river running across, this spot is incredibly picturesque. Beside the Hozu River, you can rent a "pleasure" boat. These boats will take you up and down, allowing you to see houses and landscapes only accessible from the water's edge. The boat trips usually last about two hours and can seat about 25 people although there are some small, more private, boats you can rent as well. The river was too low when we visited, so no boats were running, but it looked like one of the more enjoyable experiences you could have in town. You can also rent bicycles to bike along the river's edge, but we didn't have enough time. One these bikes you can cycle through rural areas, past farming fields and thatched roof houses. A wonderful way to explore the countryside. The Hozu River is part of the Katsura River and begins in the mountains near Kameoka, a town north-west of Kyoto City. It snakes into the Arashiyama and surrounds the edges of the city. You'll see, standing on the bridge, getting their photos taken, dozen of women dressed in stunning silk kimonos. Their hair and accessories match their outfit, and the dazzling embroidery on the kimonos sparkled in the sunlight. Kimonos are one of the most formal pieces of clothing many Japanese women own, and there are often not a lot of opportunities to wear them. But when travelling to these picturesque villages and historic towns, many women opts to wear their kimonos to both have a chance to dress in such an elegant fashion and feel a part of the historical look and feel of the city. There are also many places around Arashiyama where you can rent kimonos, so you'll often see even some Westerners dressed up in these incredible garments. I never had the guts to do so myself, but I loved watching all those rainbows strolling by. The primary place to do your shopping is on Saga-Arashiyama. This street in Arashiyama is constantly crowded with school children on break with their class, large tour groups and Westerners gawking at sweet shops creating art from spun sugar. Rickshaws run up and down the roads, getting honked at by locals trying to get back home in a hurry. The shops lining the street range from restaurants, cafes, sweet shops, ice cream vendors, kimonos designers and more. Along one street we found colourful little-rolled fortunes sitting outside a beautifully decorated house. All you had to do was slip a coin into the container and take out a fortune. Fortunes on the go. One of the more traditional snacks along the street are Senbei. Senbei are Japanese rice crackers which come in a variety of flavours. Senbei are usually eaten with green tea and sometimes offered as snack when visiting a guest house. We stopped to snack on a few different varieties. We sample both some sweet and savoury options. They were snappy and fresh, hot from the grill. The charcoal from the grill gave them a rich, smoky flavour turning a few simple ingredients into a complex dish. The most famous flavours are nori (seaweed), soy nut, soy sauce and red chilli. Handmade artisan glassware can found in various shops along the street where you can buy one of a kind sake glasses and pitchers. 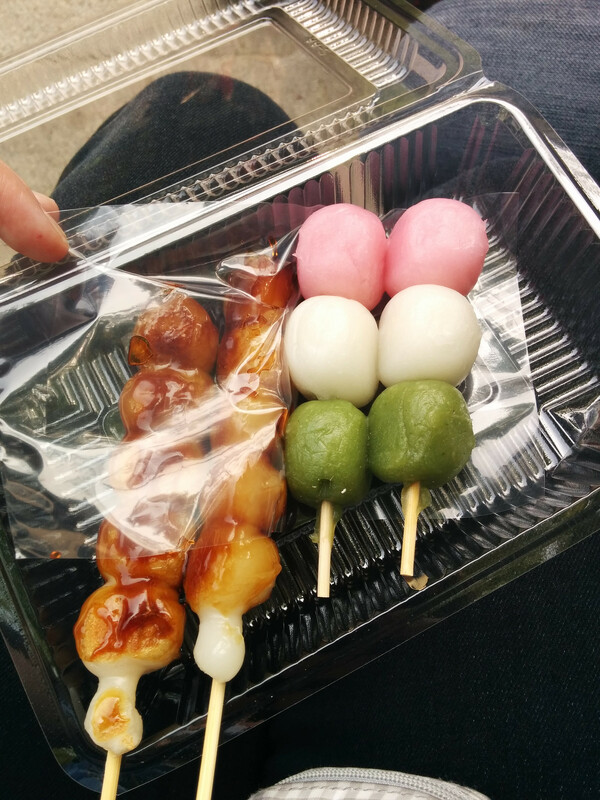 Dango and mochi are other popular desserts on offer along the street. 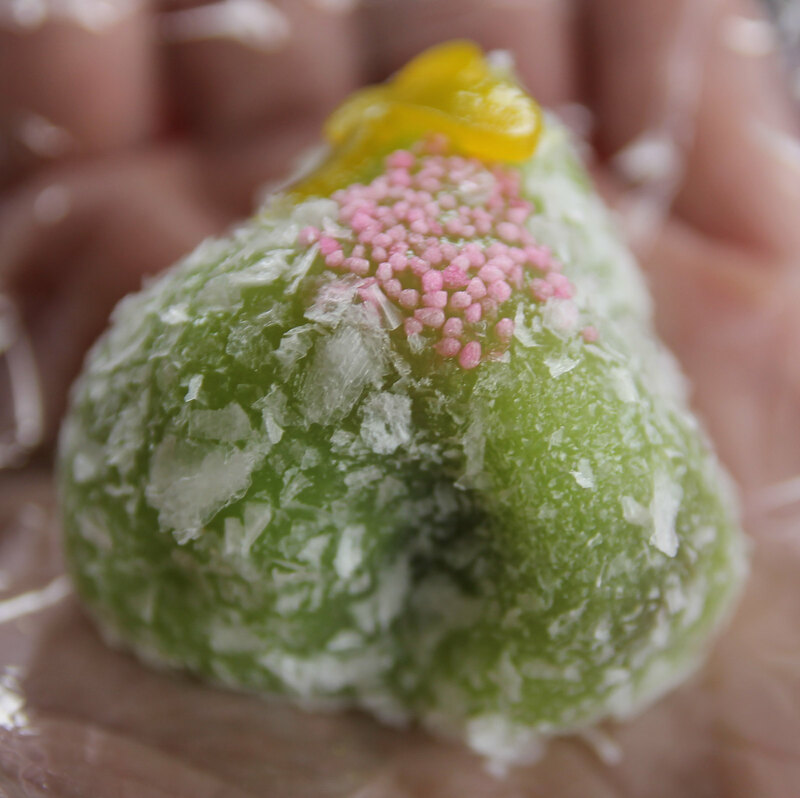 Dango and mochi are both made of pounded glutinous rice which is then moulded into different shapes. What I was looking for while we were shopping was a kimono. I had passed up on a few kimonos in Tokyo, but they all were too new and different have the kind of character I was looking for. 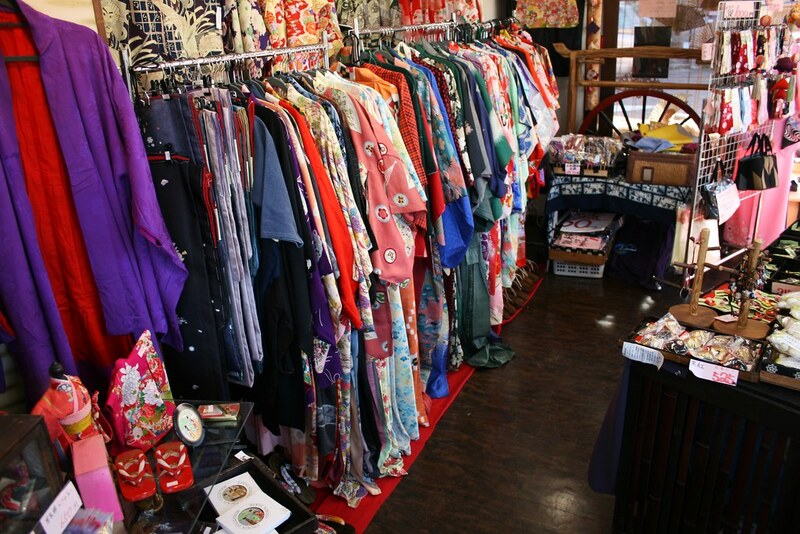 There were a range of clothing shops in Arashiyama for kimonos. 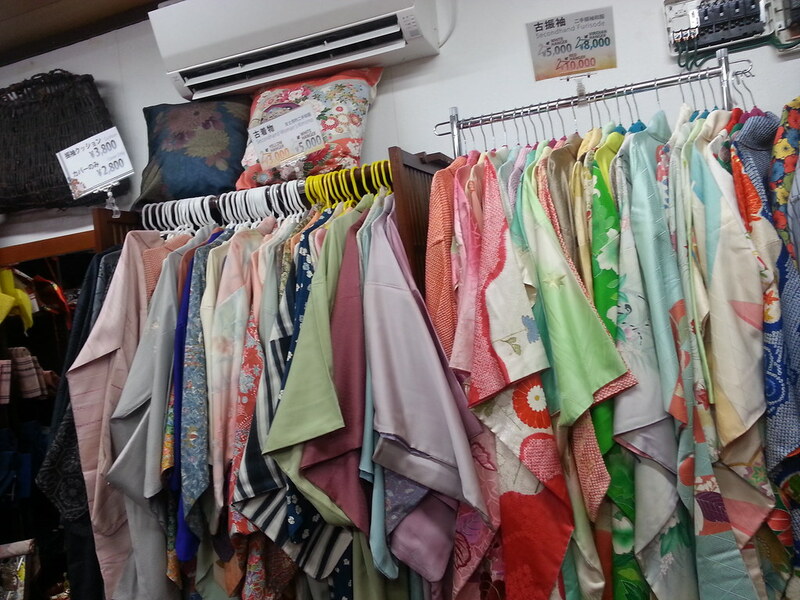 Some were by exclusive designers, others were the ubiquitous silk version you see in every tourist shop, but there was also more than one vintage and used kimono shop. These kimonos were so well taken care of and felt brand new. Their designs ranged from traditional to more modern. You could find some handcrafted and one off designs here at competitive prices. The sweet woman who owned the shop helped me try on a few different options to find my perfect look and fit. I found a white and neon robe from the 1980's that had some real unique designs that made it stand out from the other traditional ones. I loved it and got to pair it with a classic obi - all for just $25. Away from the main street, and down a narrow alleyway, you'll find Saga-Toriimoto. The houses along this road all are in the style of the Meiji Period (1868-1912) and have been preserved by the city and the owners. It is a living museum of Japanese architecture. Some of the houses have been converted into restaurants and shops so be sure to poke your head inside to get a chance to see the interior of these hundred-year-old houses. If you find yourself strolling along the backstreets of Arashiyama be sure to search out the Rakushisha Residence. 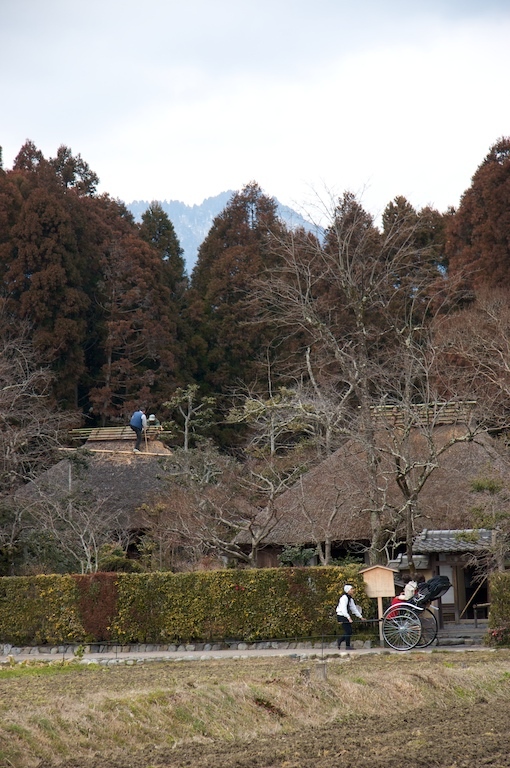 This thatched roof hut once belonged to the 17th-century haiku poet Mukai Kyorai. He is one of Japan's greatest poets, and the house is like a piece plucked out of time. You can imagine him inside there, writing out a poem on the cold, tatami floor. Along the side streets, we picked up what would be my favourite vending machine drink. It was peach flavoured water but only ever so subtly sweetened resulting in a perfect thing to drink on a hot afternoon. Here, away from the hustle and bustle of the busy streets, seeing women in their kimonos wandering down the streets seemed like something out of a dream. Walking through these tiny, side streets and peering into front yards and back porches were left like were on a Japanse secret garden tour of our own making. The area is known to be home to many artists due to its cheap rent and atmospheric environment, so lots of the houses along the way have unique decorations covering their houses. Along these backstreets, you might come across one of the vintage train stations which service the Sagano Romantic Train route. The station's columns are wrapped in bamboo shaped plexiglass, but the remainder of the outdoor structure is reminiscent of train stations from the 1920s. Behind the station, you can find the Kimono forest. The forest is made up of cylinder-shaped pillars which contained within them various textile used in the design of traditional Japanese Kimonos. There are about 600 different pillars with 32 different patterns inside. Walk around to see if you can spot them all! The best time of day to see this exhibit is at dusk since the columns all light up and form a glowing pathway. After a long day in Arashiyama, it was time to head home. We decided to take the railway home since it was going to be a much shorter commute and weaved through the side streets to make our way to the subway. On the ride home, we got to watch hundreds of houses whiz by on the train, leaving the calm, open fields of Arashiyama behind as we cruised into the centre of Kyoto. Like so many travellers before us, we reminisced about the magical town we left behind as we walked back to our hotel. We were so glad to spent as much time out there as we did and didn't try to rush out and just check off things on a list. Exploring, getting lost and stumbling upon hidden gems is the best part about travelling.